Through 7/29 get $2 off the purchase of Mariage Soeurs. No coupon necessary. Discount reflected once pattern is in cart. 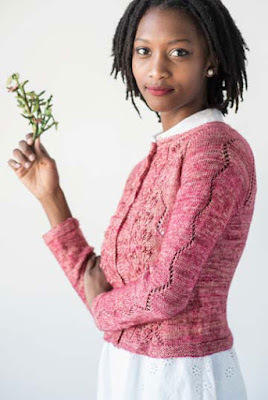 Originally designed for my sister’s wedding, this delicate cardigan combines Marriage Lines lace with the bobble-rich Nosegay pattern to create a feminine sweater suitable for any occasion. Waist shaping, ¾ sleeves, and lacy raglan lines highlight its femininity and make it suitable for year-round wear. Click on any of the photos to visit the pattern page on Ravelry. 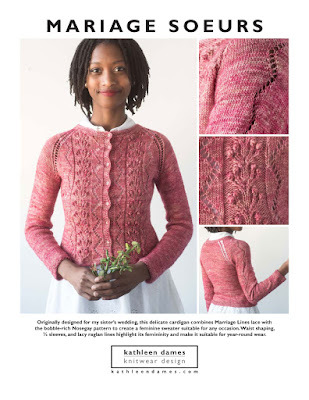 Click the button to purchase your copy of the pattern PDF. 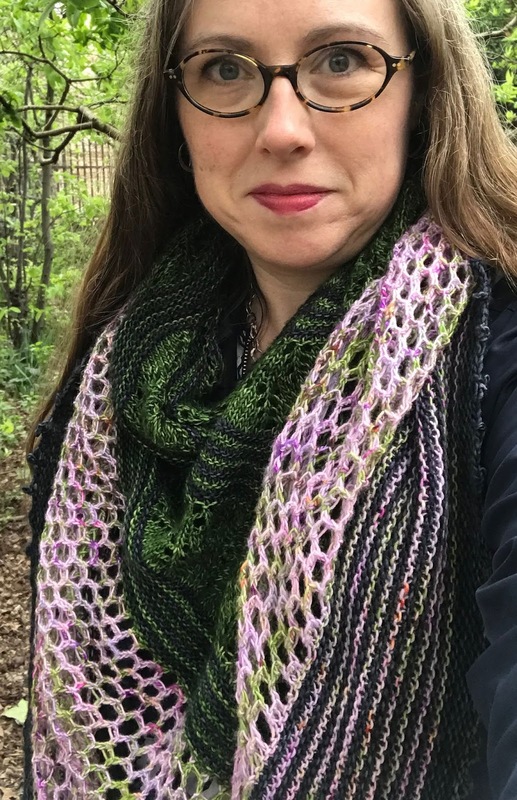 Originally designed and knit as a gift for my daughter as a graduation present to wrap her up in my love, recent news compelled me to become one of the helpers by publishing the pattern and using the proceeds to help other families stay together and/or reunite. Many thanks to my quick testers, as well as my technical editor, who donated her services for this pattern. All proceeds from this pattern will be donated to Together Rising on an ongoing basis. For more on what Together Rising is doing, click here. 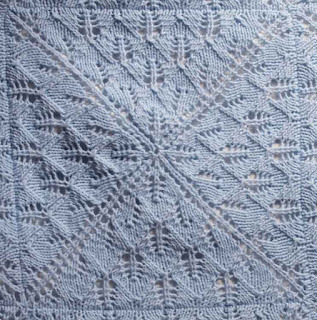 Mother & Child Reunion is worked as individual squares then joined to form a square blanket or a long rectangular wrap. Until the very end, when you have a large, lovely pile of knitting on your lap, this is a perfect portable project. The Big Blanket size makes a generous 50-inch throw using Berocco's Vintage Chunky (an excellent, half wool, low maintenance yarn in lots of colors) using less than one skein per square, while the 30-inch Baby Blanket and 20x70-inch Wrap call for two or three skeins, respectively, of Backyard Fiberworks Sock (or your favorite sock yarn) using one skein for five squares. Each square is worked in the round from the center out, then stitches from the final round are placed on waste yarn. 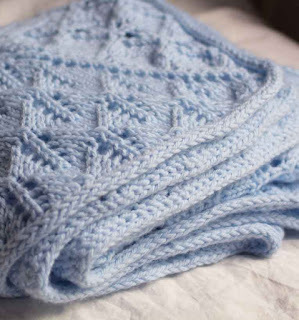 Squares are joined together with a Three-needle Bindoff (Kitchener Stitch for the wrap). All remaining live stitches around the edge are finished with an I-cord Bindoff, which gives a lovely, clean edge (and a new skill, if you haven't tried that bindoff before). 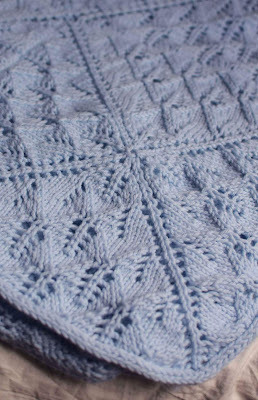 Fern Lace is provided in both charted and written forms, so you've just run out of excuses to wrap someone up in your knitted love. Thank YOU for purchasing this pattern. All proceeds will go to Together Rising on a monthly basis to help Together Rising support carefully vetted organizations across the country working tirelessly to reunify children with their families. 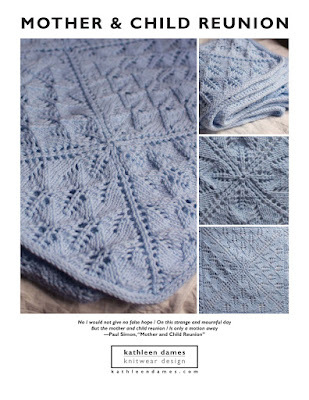 Interested in a KAL? Subscribe to my newsletter, and I will let you know all the details shortly. 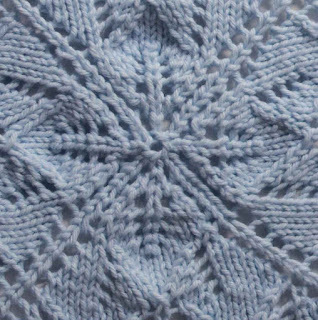 This pattern would also work beautifully for a Welcome Blanket if knit in DK or worsted weight yarn, though I have not yet worked a blanket in that size. Choose a needle size as specified on your yarn's ball band, work one square and block it. If your square is approximately 13 inches, you are all set to make a 40-inch Welcome Blanket. Thanks for stopping by, and happy knitting! Are you the leaf, the blossom or the bole? How can we know the dancer from the dance? 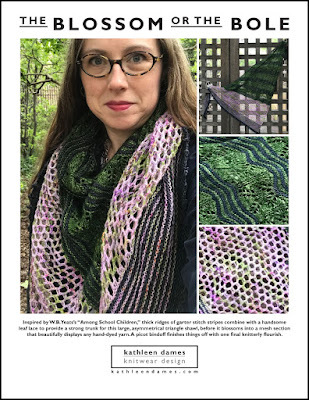 Inspired by the Yeats poem "Among School Children", this asymmetrical triangle shawl begins with Garter Stripes then alternates stripes with Leaf Lace before bursting into a large section of Birds Eye Mesh. A few more Garter Stripes and a Picot Bindoff finish everything off. 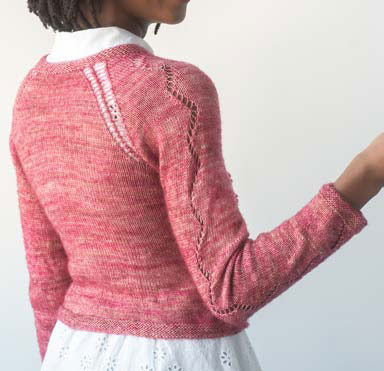 Choose three skeins of your favorite sock yarn and enjoy a fun (but not too challenging) knit. Stitch patterns are provided in both written and charted formats. Guess where I’m going next week! For One More Row Press's next publication, Alice and I are going on a recon trip and connecting with our Parisian designer and dyer friends. I’m off to get a new pair of sneakers, but share your recommendations of anything we shouldn’t miss in the comments. Sign up for my test knitting newsletter here. It was a year, 2017, wasn’t it? center - hero shot from Quadrille, a sweater originally inspired by my dear grandmother’s vest that was her souvenir from Ireland. Happy that family, friends, knitting, and resistance all were part of my 2017. Happy New Year, my friends. Let’s make history in 2018.
xoxo, Kathleen . . .